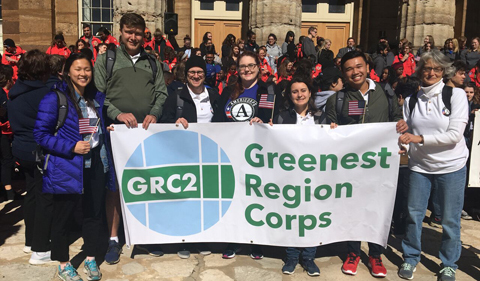 Ohio University alumnus Jordan Francisco ’18 is working on recycling and composting projects and as he volunteers in the Greenest Region Corps, a program jointly funded and run by the Chicago region Metropolitan Mayors Caucus and AmeriCorps. Francisco earned a B.S. in Environmental & Plant Biology from the College of Arts & Sciences at OHIO. “The objective of the Greenest Region Corps members is to assist communities in the Chicagoland area with their sustainability planning. Corps members in this particular program utilize the Greenest Region Compact, which is a collection of sustainability plans that address many categories in sustainability, such as economic development or land use. The Greenest Region Compact has been agreed upon by 107 communities and counting, making this the largest regional collaboration of municipalities working towards sustainability in the U.S.,” Francisco says. 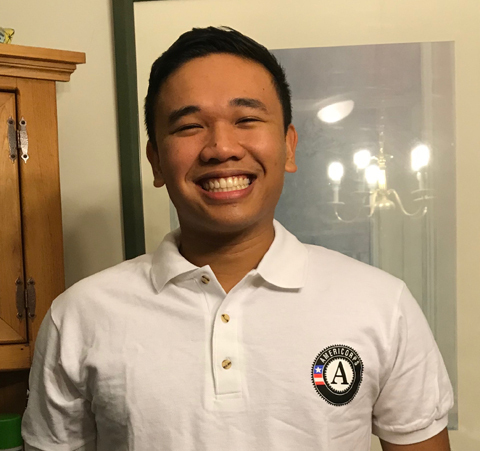 Jordan Francisco proudly wears his Americorps shirt. He is assigned to two municipalities in the north of Chicago—the villages of Libertyville and Grayslake. “I will serve my first half of service in the village of Libertyville, where I am assisting in the village’s efforts to increase commercial businesses’ participation in recycling. In early to mid-2019, I will switch over to the village of Grayslake, where I’ll assist in their composting program,” Francisco says. “I’m overall excited and feel blessed to have stumbled upon this opportunity. It is an amazing feeling to be able to use what I learned at OHIO and apply it to the real world where I’m making an impact in my community. At OHIO, Francisco also took advantage of the opportunity to earn the Certified Interpretive Guide credential. He also explored peanut plants as natural fertilizer during his undergraduate research.